Hmmmmmmm ". . . test upload" according to the about section. That calls for a "Test Critique"! The lighting in this image has been done very well and I especially like the diffuse nature of it and the fact that it gradually descends into a darker, almost vignette style corner shadow. The shadowy area behind the object offers a pleasing mix of shadow and reflection . . . with the tonal range coming through with almost textbook variation - The cherrywood(?) is nicely saturated with an appropriate amount of color and the reflections in the hour glass give virtually no distracting views that would cause a viewer's eyes to be distracted from the overall composition. The brass accents and sand balance the range of light values and the minimal composition seems to be just about perfect with a pleasing touch of balance by the off-centered object and a higher and leftward shadow to off-set the alternate interest points along with the "rule" of thirds guidelines. Since this IS a CC image I should point out that (IMHO) the white signature line in the lower left is really not good for this image . . . it's . . . you know, . . . a tad distracting. I would (were it mine) prefer to see it almost melt into the BG and likely make it a tad smaller as well. Overall though . . . Nicely Done . . . ! very nice subject, composition and colors. the lighting is also perfect and the shadow is adding alot of value..
A superb image, Phillip! Lovely colours and comp! Wonderful lighting! reflect my state of mind , and there it was!!!! Your horizon in the sand is tilted. The shadow is out of focus and there are an even number of visual objects. 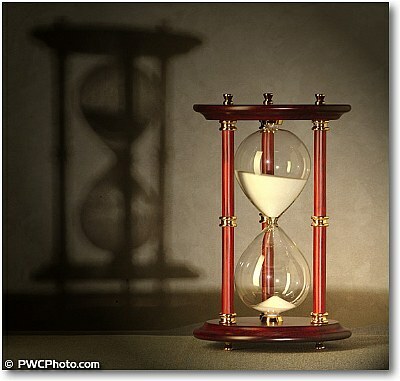 At least the fabric under the hourglass is not wrinkled! Wow 2 Phill's and 2 Eric's in one short time. Okay who pushed who to post? I find one nice photo finally. Very nice shot and with wonderful composition and very pleasant tone (red), The background is appropriate.excellent idea!! !